French niche line The Different Company will launch Le 15, a new limited edition fragrance celebrating the brand's 15th anniversary. « For a long time, creating an essential fragrance seemed indispensable for me. What matters more than speaking to the Gods, sending a sacred sillage to a mythical beyond or show our pleasure to wear a unique perfume? Incense and Myrrh facets on a sacred wood structure, the Palo Santo, a mystical composition that captivates just like the shaman’s poem, an ode to the Eternal rooted in a sensual and powerful scent. Le 15 was developed by perfumer Alexandra Monet. Additional notes for the spicy woods fragrance include bergamot, petitgrain, nutmeg, hedione, vetiver, gaiac wood, cistus, Atlas cedar and musk. 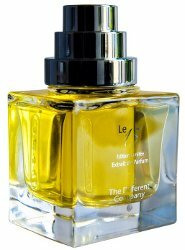 The Different Company Le 15 will debut in September, €139 for 50 ml Extrait de Parfum. Oh this sounds gorgeous. I had TDC Rose Poivree and I loved it! It was unlike any other rose I have tried. I experienced a slight savory vibe in the dry down,kind of like celery. This sounds very interesting to me, as well. Hope it is a good one. Sounds really interesting and deeply lovely. I hope the reality is as poetic as the press release! Is it just me or are the perfume companies trying too hard to seem trendy? What’s up with the name of this scent? I can imagine a conversation something like… “Wow, you smell great!” “Thanks, it’s Le 15. Huh? At least the notes sound beautiful but IMO the name is a bit ridiculous. Please feel free to correct me if Iam missing something. I a not familiar with this brand.